Disclaimer: *Lease: 1.90% for 48 months. Offer expires April 30, 2019. 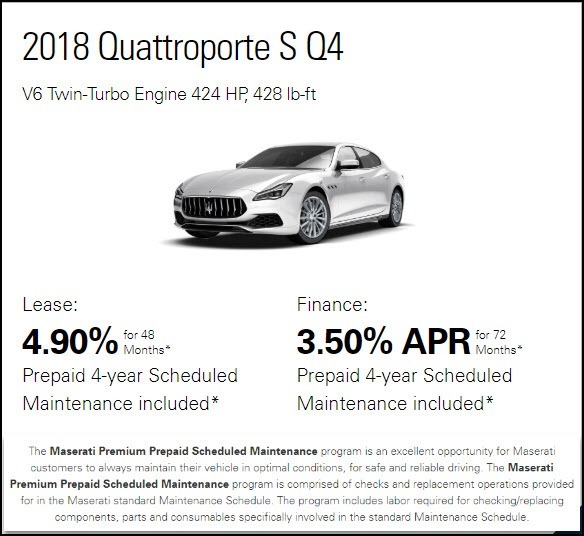 Limited time lease offer provided through SCI Lease Corp on approved credit at participating Maserati dealers and is valid on 2018 Ghibli S Q4 models only. 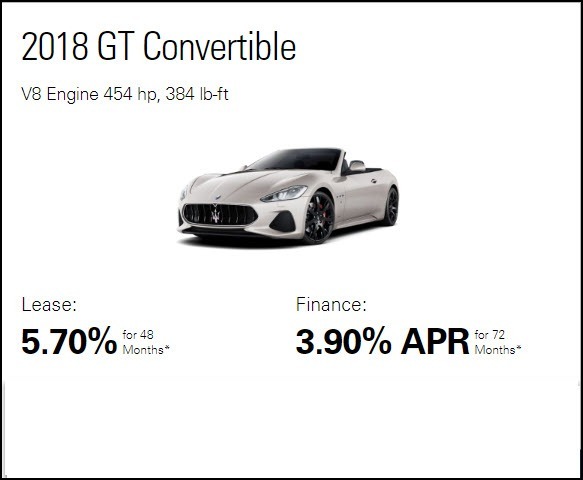 *Finance: 0.9% APR for 72 months: ON APPROVED CREDIT. Offer expires April 30, 2019. Limited-time offer provided on approved credit by RBC at participating Maserati dealers on 2018 Ghibli S Q4 only delivered by April 1, 2019. Disclaimer: *Lease: 4.90% for 48 months. Offer expires April 30, 2019. 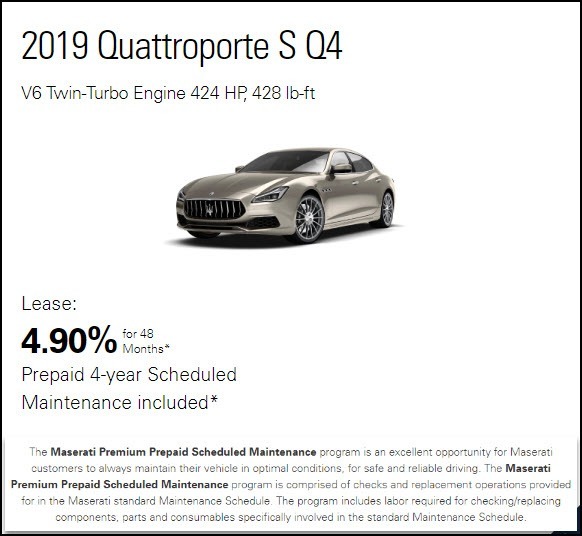 Limited time lease offer provided through SCI Lease Corp on approved credit at participating Maserati dealers and is valid on 2018 Quattroporte GTS GranLusso models only. 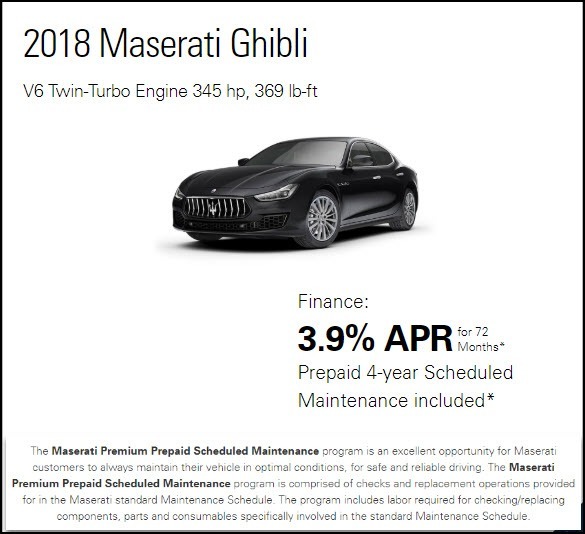 *Finance: 3.50% APR for 72 months: ON APPROVED CREDIT. Offer expires April 30, 2019. Limited-time offer provided on approved credit by RBC at participating Maserati dealers on 2018 Quattroporte GTS GranLusso only delivered by April 30, 2019. Disclaimer: *Lease: 5.70% for 48 months. Offer expires April 30, 2019. Limited time lease offer provided through SCI Lease Corp on approved credit at participating Maserati dealers and is valid on 2018 Gran Turismo Convertible MC models only. 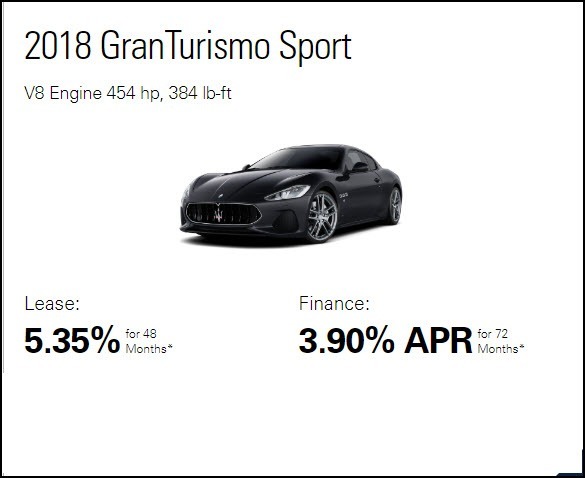 *Finance: 3.90% APR for 72 months: ON APPROVED CREDIT. Offer expires April 30, 2019. Limited-time offer provided on approved credit by RBC at participating Maserati dealers on 2018 Gran Turismo Convertible MC only delivered by April 30, 2019. Disclaimer: *Lease: 5.35% for 48 months. Offer expires April 30, 2019. 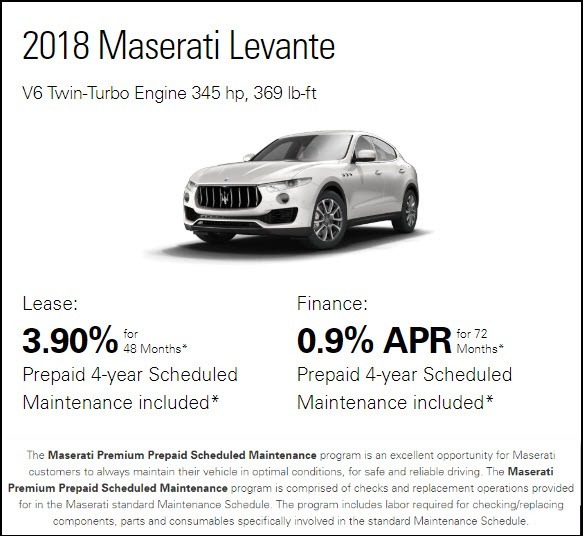 Limited time lease offer provided through SCI Lease Corp on approved credit at participating Maserati dealers and is valid on 2018 Gran Turismo MC models only. 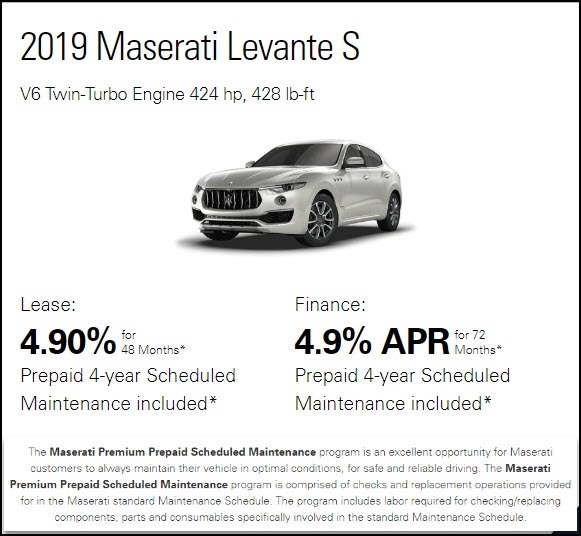 *Finance: 3.90% APR for 72 months: ON APPROVED CREDIT. Offer expires April 30, 2019. 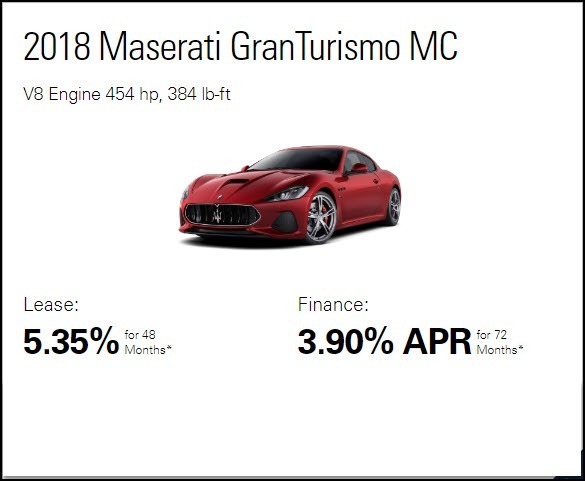 Limited-time offer provided on approved credit by RBC at participating Maserati dealers on 2018 Gran Turismo MC only delivered by April 30, 2019.